Convert and copy YouTube videos to PSP with mediAvatar YouTube to PSP Converter! You can now download YouTube FLV/HD videos and then convert YouTube to PSP videos in 1080p, 720p, 480p resolutions within a single step once you have this smart YouTube/FLV to PSP converter. mediAvatar YouTube to PSP Converter provides you with flexible ways to download YouTube videos: browse, search, play, and download any video directly with this YouTube/FLV to PSP converter’s ingenious built-in browser; drag and drop the video URL from your web browser to this YouTube video to PSP converter; right click on the video URL in Internet Explorer (IE). Download mediAvatar YouTube to PSP Converter now! It has never been easier to transfer YouTube videos to PSP! Download and convert YouTube FLV/HD videos to PSP video formats (MP4, AVC, MPEG-4) in various resolutions (480p, 730p, 1080p). Download and convert videos from YouTube to PSP in a single step. 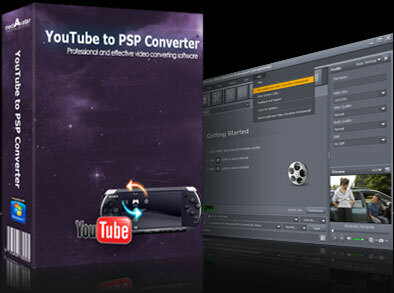 Download and convert YouTube videos to PSP videos in batches. Download videos from YouTube to PSP while browsing with Internet Explorer (IE), by dragging and dropping the video links to application, or via the built-in video browser. Supports multithreading and batch processing, allowing for high-speed multi-file download and conversion. Easily search, view, and download YouTube videos with mediAvatar YouTube/FLV to PSP Converter's ingenious YouTube Video Browser – the smartest way to download YouTube videos to PSP! Install this YouTube to PSP converter on your PC and you can download any YouTube video by right-clicking on its URL and selecting the download option in right menu. Simply drag the video URL and drop it directly to the program or the "Drop Zone" to start the downloading. mediAvatar YouTube/FLV to PSP Converter allows you to configure a proxy server for downloading YouTube videos to PSP. Optionally set a "Post-Task Action”"(system shut down, hibernate, stand by, exit application) and the selected action will be automatically executed once all tasks have been completed. Five interface languages are available: English, German, French, Spanish and Italian.